Social dinner on Sunday 14th June. For tickets please contact your local office, information available in the flyer. 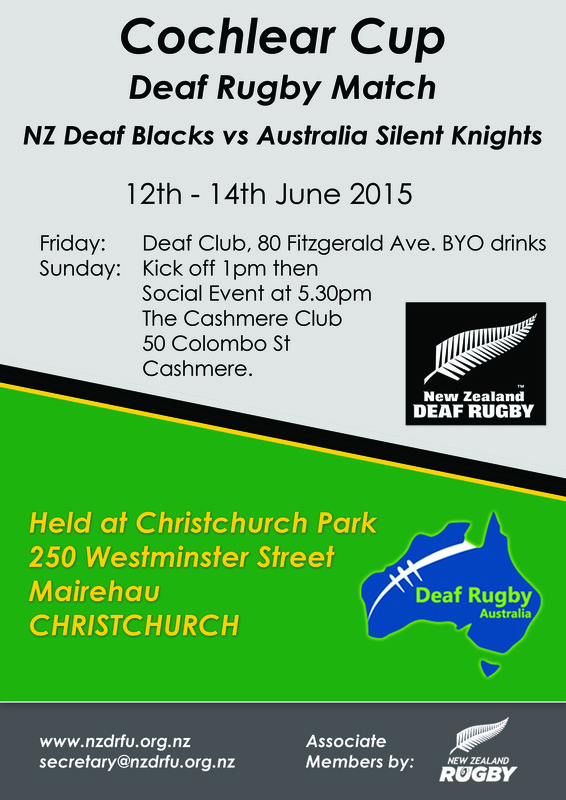 Deaf rugby match - New Zealand vs. Australia, will be held in Christchurch from 12th-14th June. Not to be missed! For more information please see the flyer. 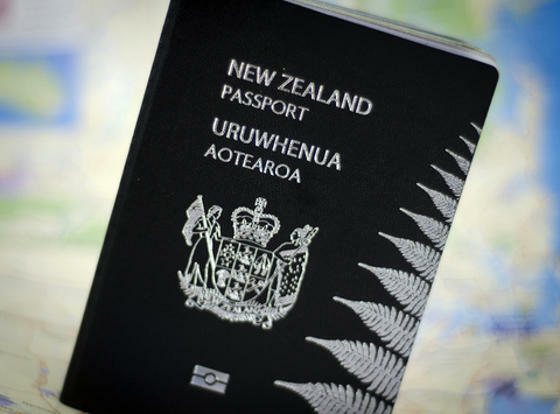 From 31st December 2015, adult passports will be valid for 10 years instead of five years, and will cost $180. The 10 year validity period is easier for most adult passport holders, as they will not need to renew their passport as often. Because a child’s appearance can change significantly over time, the child passport will stay valid for five years. Internal Affairs Minister Peter Dunne said the price of the 10 year password will reflect the need to keep the price affordable as production costs will be spread over lower quantities. 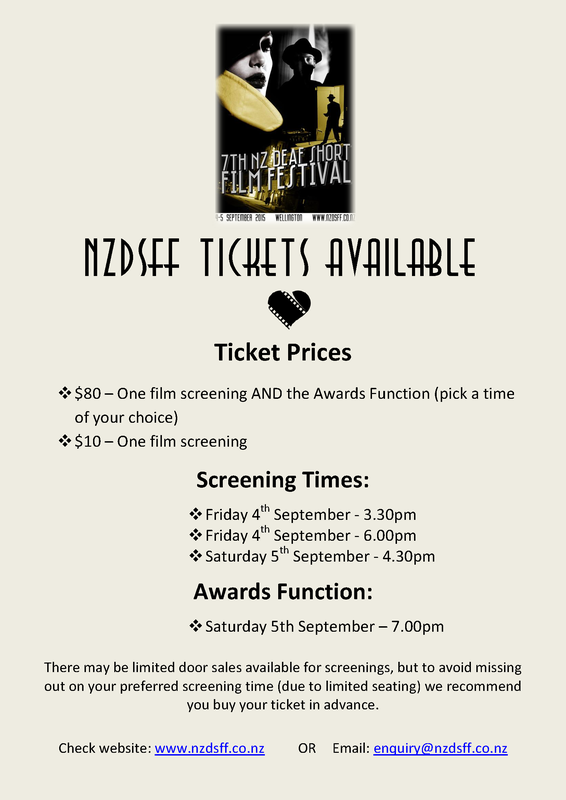 The NZDSFF is happening in September! If you're keen to go along or even get your hands on some merchandise, check out the flyers below for more information. Frontrunners – Mark Berry Says Hello! Mark Berry, who has just completed his Frontrunner’s 10 course in Denmark shares a brief summary of his experience and strongly encourages young Deaf adults to apply for the next one: Frontrunners 11!!! Who can participate? Deaf People aged between 18 and 30 years. No more than 2 applicants from each country can be accepted. What’s next for him? He will be attending the World Federation of the Deaf Congress in Turkey, July 2015! He’ll be back in Wellington one day and will be able to present all about his exciting overseas experiences, so watch this space! Come along and see an awesome variety of stalls and stall holders with something for everyone!! Arts, Crafts, Coffee, Food! Even live Music! 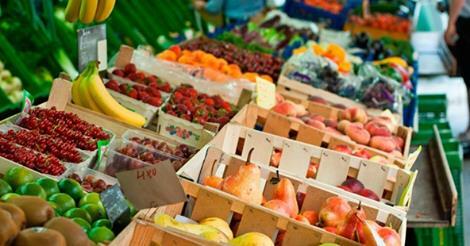 Paihia Farmers' Market is a place where you can buy fresh local food, grown or produced. Buy it fresh from the market to your plate! Demonstrate knowledge + skills for driving on a road for endorsement W (wheels) R (rollers) T (trucks). 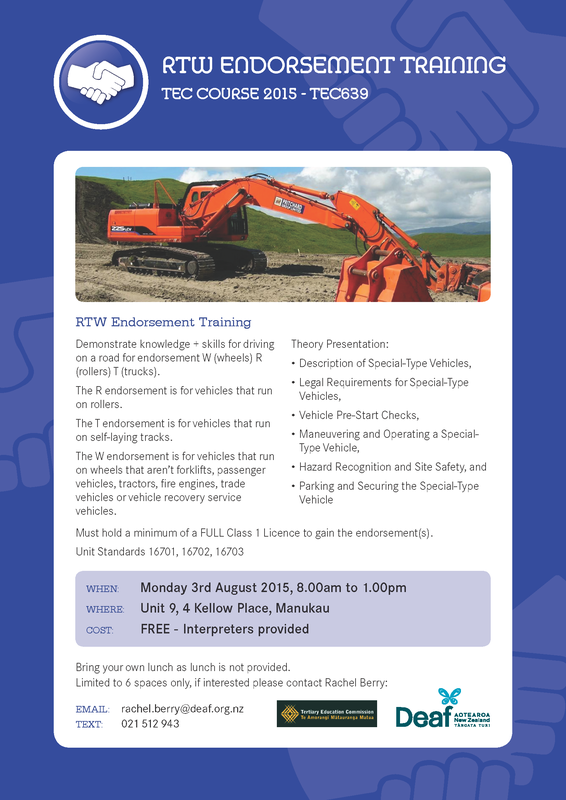 The W endorsement is for vehicles that run on wheels that aren't forklifts, passenger vehicles, tractors, fire engines, trade vehicles or vehicle recovery service vehicles. (Must hold a minimum of a FULL Class 1 Licence to gain the endorsement(s). Bring your own lunch as lunch is not provided. 6 spaces only, if interested please register now. Applications close on 30th June. If you are interested, please contact Rachel Berry for a copy of the form of regulations. 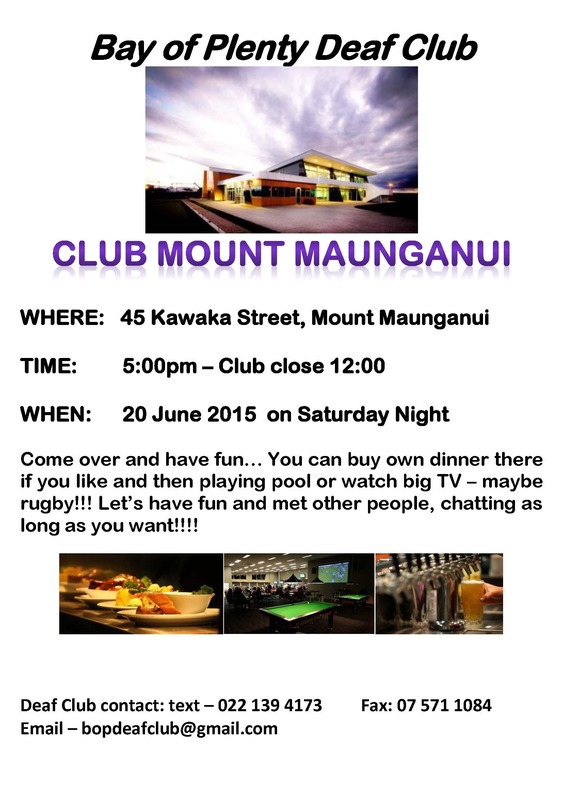 Where: Clubroom – 183 Great South Road, Papatoetoe. 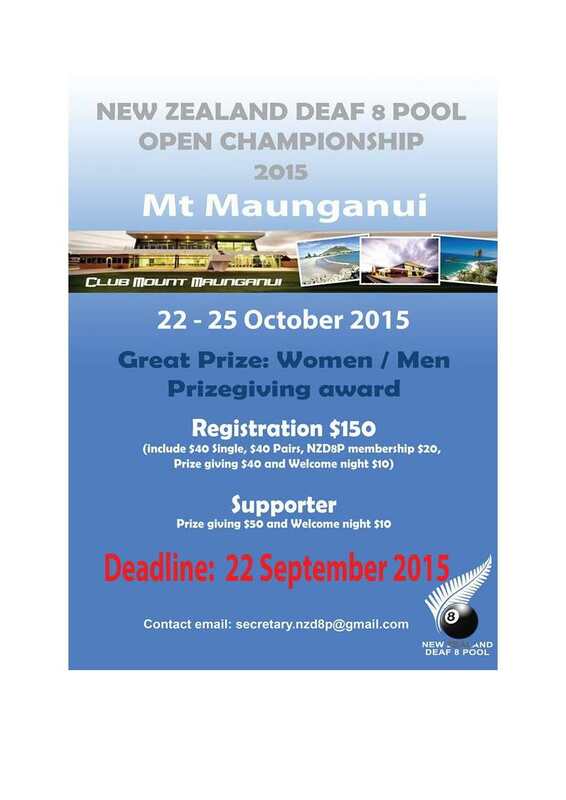 Last month we had a fabulous NZSL month, but it has now come to end. 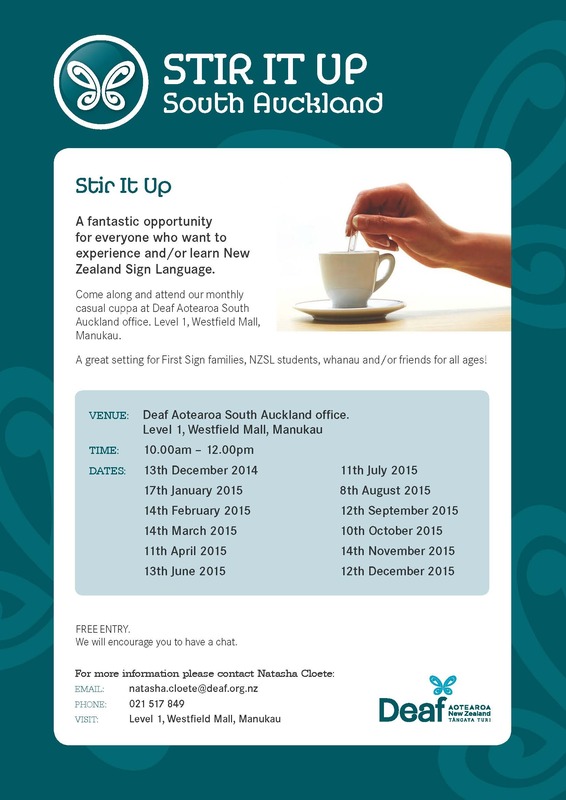 If you want to learn more NZSL, come along to the Stir it up event. 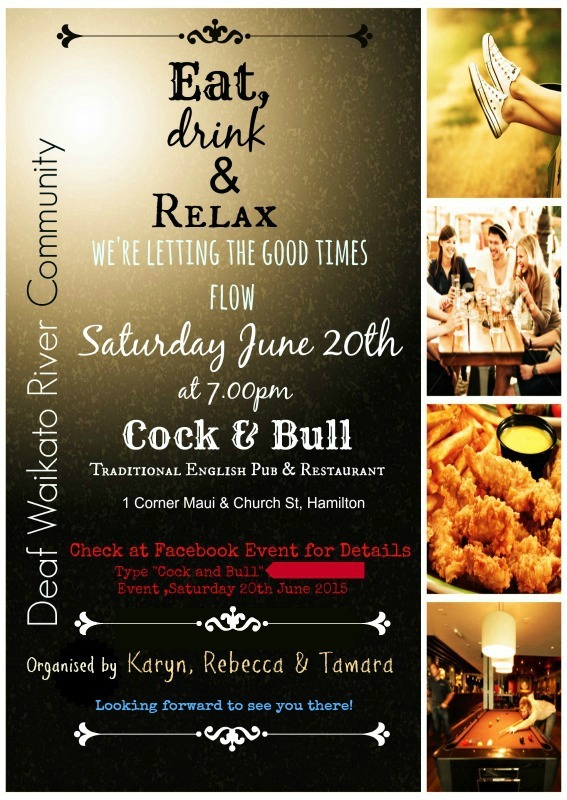 Where: Deaf Aotearoa office South Auckland, level 1 Manukau Westfield mall. Do you know how to use Video Remote Interpreters (VRI) for your visits to government agencies? Do you know how to use Video Relay Service (VRS) when you need to contact hearing, other Deaf, hearing impaired, Deafblind or speech impaired people? Do you know about CapTel? This is a FREE service for the hearing impaired… It is a captioned telephone that connects to the internet and displays captions of your conversation while you’re speaking. Just like an ordinary phone – but you can read what the other person is saying! Do you know how to use TXT 111 – an emergency text service? Have you registered or know how to register? This is a great seminar for all to attend. Come and learn how to use this technology that will support you in everyday living. Gain independence and be empowered! Stir It Up – Games Day! Let’s play Charades (an acting game). 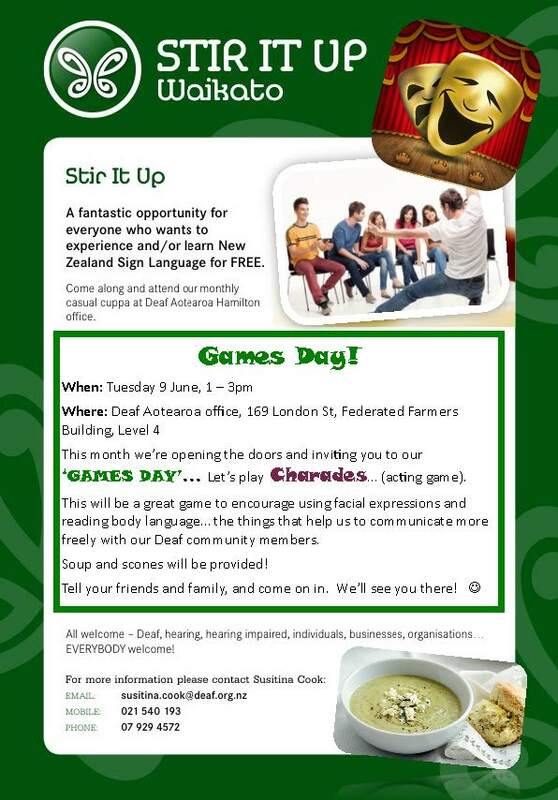 This will be a great game to encourage using facial expressions and reading body language… the things that help us to communicate more freely with our Deaf community members. Soup and scones will be provided. Tell your friends and family, and come on in. We’ll see you there! Want to experience Waka Ama? 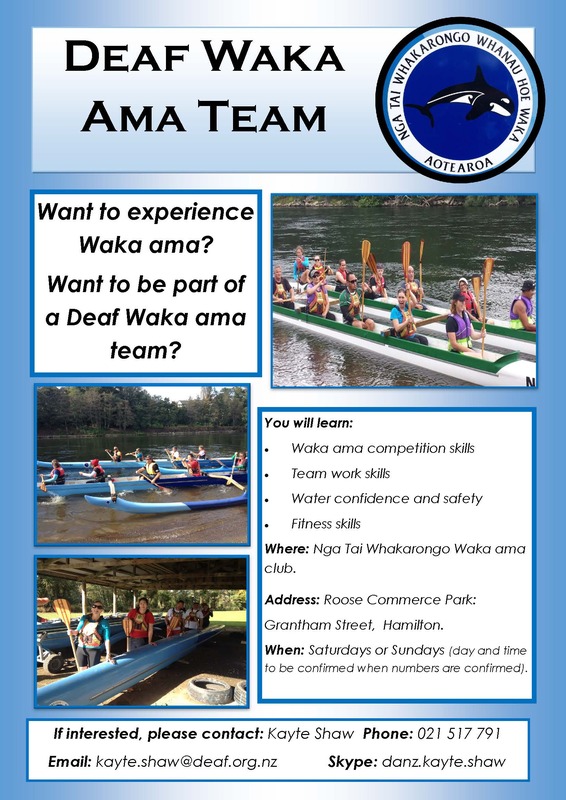 Want to be part of a Deaf Waka Ama team? If you are interested, please contact me as soon as possible. Eat, drink and relax. We’re letting the good times flow! You are invited to this seventh disability networking for inclusion seminar. Paul Curry will talk about accessing our community in everyday life with a disability. Gerry Pomeroy from CCS will talk about transport initiative. Shirley Wilson from Brian Injured Children Trust will talk about the ‘goBabygo’ project. Hon. Simon Bridges will talk about the government’s position on transport for the disabled. Afterwards there will be refreshments and networking. 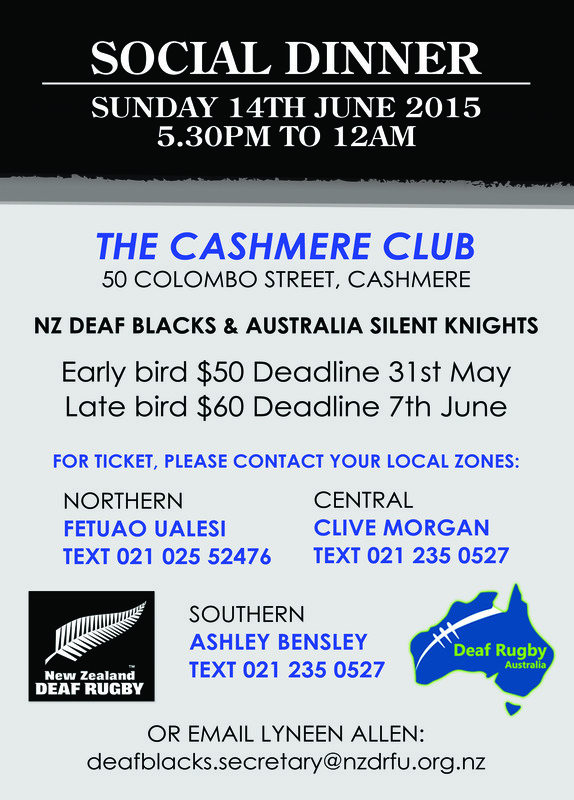 Please contact Gill Gardener to reserve your place and tell her you are a NZSL user to be reserved in the front. VRI – What is this? This is a technology service for the Deaf who live in areas where no interpreters are available. It’s a free service for the Deaf people wanting to communicate with government agency staff. This service can be for Work and Income, Child Youth and Family, Senior Services, ACC, Ministry of Health and health professionals and Ministry of Education. If you have a meeting with your child’s teacher, this is a good service for you to use. Join the fun and catch up with your friends. You can buy dinner there, play pool and/or watch TV. Click on flyer for more information and contact details to put your name down. Cost: $10.00 per person for pool game. 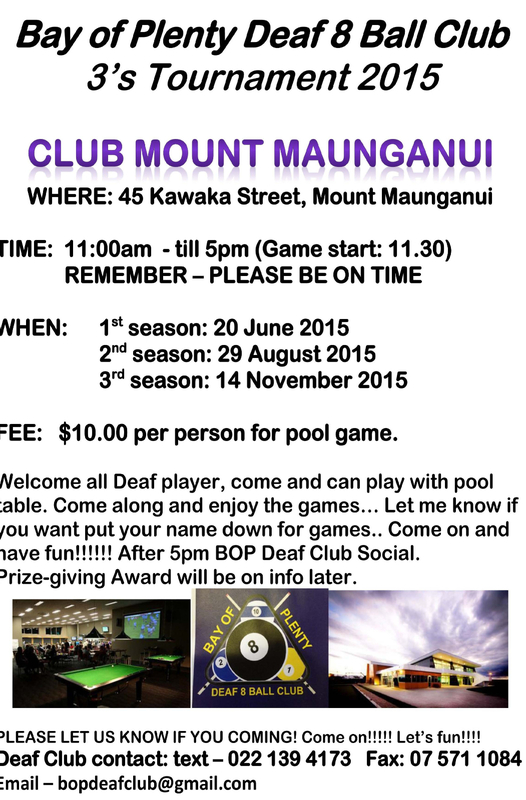 This is a tournament for all Deaf players to join and have fun competing. Click on flyers for more information. Please make note that staff will be attending Deaf Aotearoa’s service training on Monday 8th June and Tuesday 9th June. This will help us get ready to increase services from 1st July. We will open as usual on Wednesday 10th June. WHERE: The TATATM is located on the corner of State Highway 3 and Kent Road, 8km south of New Plymouth opposite Lake Mangamahoe. COST: There is no charge for families who are financial members of PODC. 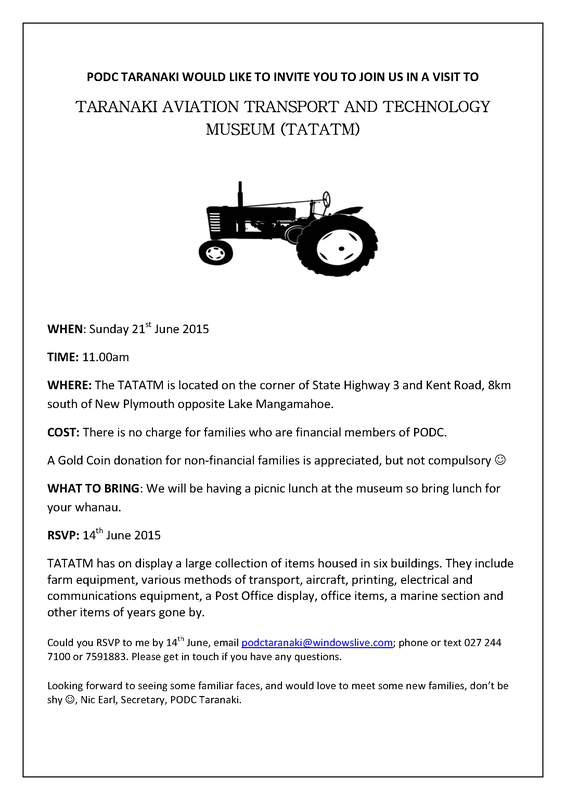 WHAT TO BRING: We will be having a picnic lunch at the museum so bring lunch for your whanau. 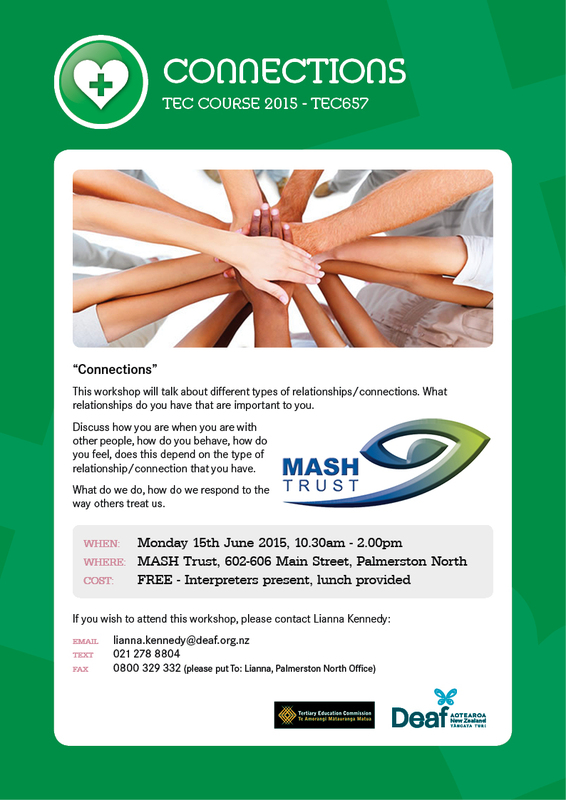 Could you RSVP to Nic by 14th June, email podctaranaki@windowslive.com; phone or text 027 244 7100 or 7591883. Please get in touch if you have any questions. 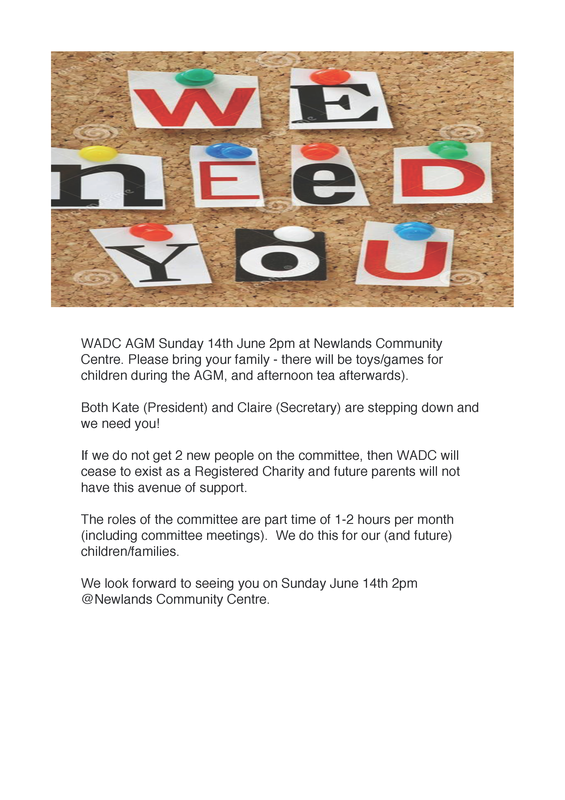 Looking forward to seeing some familiar faces, and would love to meet some new families, don’t be shy, Nic Earl, Secretary, PODC Taranaki. Please see flyer for more detailed information. Bring whanau and friends and spend the day listening to our great entertainment while enjoying the great food on offer and checking out our stalls that range from, fruit n veg to crafts to, bits n bobs. 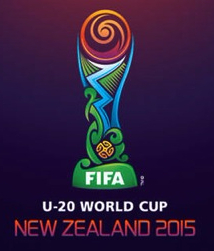 FIFA U-20 World Cup 2015 is coming to New Zealand and Stadium Taranaki (Yarrow Stadium) will host six games - five pool matches and a Round of 16 clash. Take a look at the match schedule here. Check out individual team profiles. The Pen is designed for fans age 15 - 25 to have some fun, $19 and $8 for children. Tickets on sale now from TSB Showplace Ticket Office or online here. High Tea at Tupare. 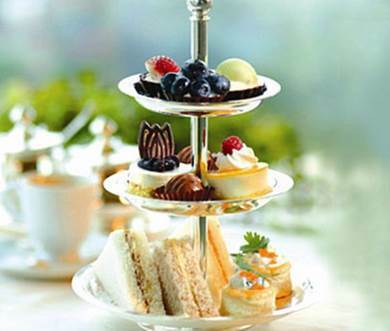 Dress in your finest and soak up the atmosphere whilst enjoying a delicious high tea. Friends of Tupare Chapman-Tour historic house tour included. In association with Mangorei School PTA, for more details visit www.tupare.info . Tickets available at Blackbird Boutique, 148 Devon Street East, New Plymouth ph 759 0011. You may be aware of the New Zealand Flag Consideration Project, the formal process for the New Zealand public to consider the future of our national flag. You can find more information on the project website here. 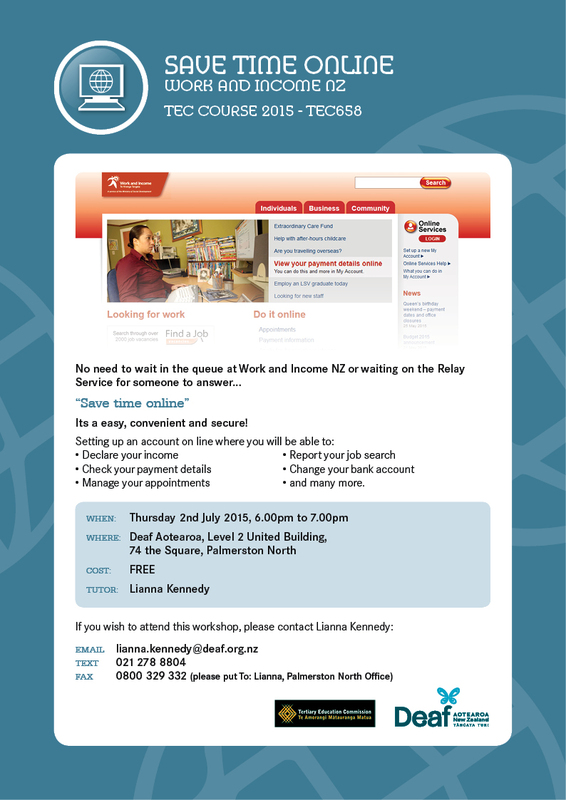 When: The roadshow will be in New Plymouth, on Tuesday 9th June. Where: The information stand will be at Huatoki Place, Devon St West from 12pm to 2.30pm. And there is a public workshop from 5.30pm - 7.00pm at the Quality Hotel on the corner of Courtney and Leach Streets. These activities will provide people with information about the history of the New Zealand flag, how they can participate in the project, and an opportunity to share what is important to them about New Zealand. This is the first time in history that New Zealanders are able to have a say in the future and design of our flag. We would like everyone to have an opportunity to participate. How To Have A Healthy Home? Living in a dry and warm environment is good for everyone. For people with asthma it is especially important and there are other issues that are vital for them to stay well. There are wonderful tips and easy to follow. What kind of heating is best for my health? Many houses are damp and cold, leading to more colds and flu and aggravating asthma. Making your home dry, warm and pollution-free will make it a healthy home and also save money and energy. These are some of the simple and easy information from Healthy Homes. Please do check out all the other tips. this workshop will help decide which smart phone, tablet or broadband you can purchase to access to communication services to your choice. This is an exciting course that will make you tech smart and understand your devices and how they work and what not to do! Bring your mobile phone or tablet. Access to WIFI will be available. See flyer for more information, if you want to come to this workshop please contact Lianna before Thursday 11th June. A new and better way of doing things online rather than waiting in queues at Work and Income NZ. This workshop will show you how to do this. See flyer for more information, if you want to come to this workshop please contact Lianna. We do not have enough numbers for this workshop, we had many people last year saying they want to do this weaving workshop, however the numbers are very low. If you are interested in coming to this fantastic one opportunity workshop please let Lianna know, see flyer attached. Hope to see you there to support this event! Natalie King, who was the Community Relations Officer, has departed the Wellington team to return to her homeland in the UK – she will be sorely missed. Since April, we have had Erica Dawson as part of our team providing business support. Erica will now be moving into the role of Executive Assistant – we wish her a very warm welcome to Deaf Aotearoa. Providing updates on the WCC’s accessibility work, and how to solve problems and influence decisions. Both the President and Secretary are stepping down, opportunity to be involved! 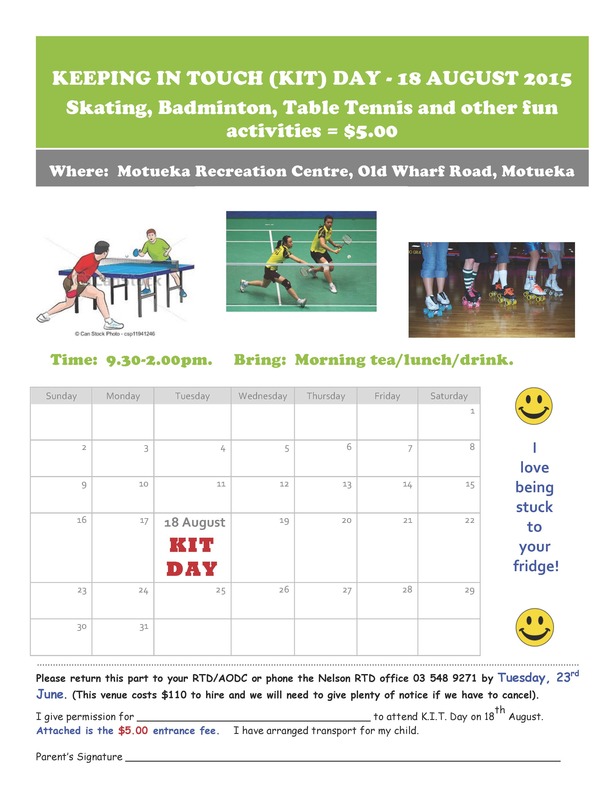 Family friendly – toys/games available for children during the AGM. To celebrate the launch of Wellington’s new office in NZSL week, we are doing a “Faces of Deaf Aotearoa – Wellington” series of one staff member per week. They will introduce and share a little bit about their work and personal passions! Last week we began the series with Jared Flitcroft, this week we have…. Next week we will have: Erica Dawson! 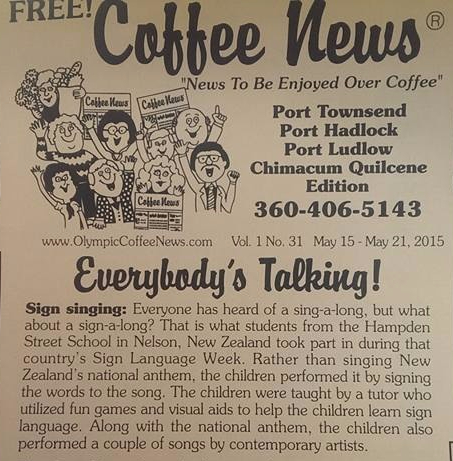 Talitha Suryan one of our Deaf community members who now lives in Port Townsend, America with her husband and family was most surprised when she read her local coffee news. The news was about the students at Hampden Street School Nelson who signed the National Anthem during NZSL week. News can travel so far. NDC are having their Mid-Winter Christmas lunch at The Apple Shed in Mapua. 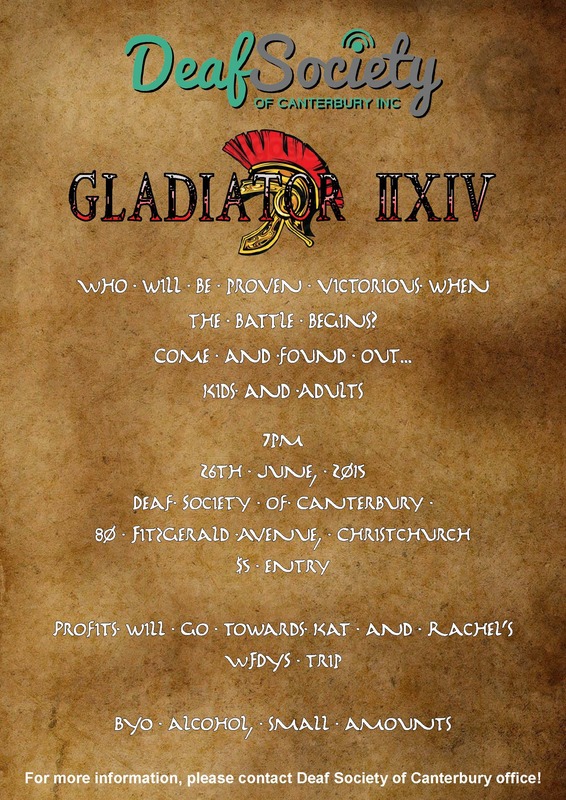 Please let the secretary Rachel if you are coming by 13th June also if you require transport. 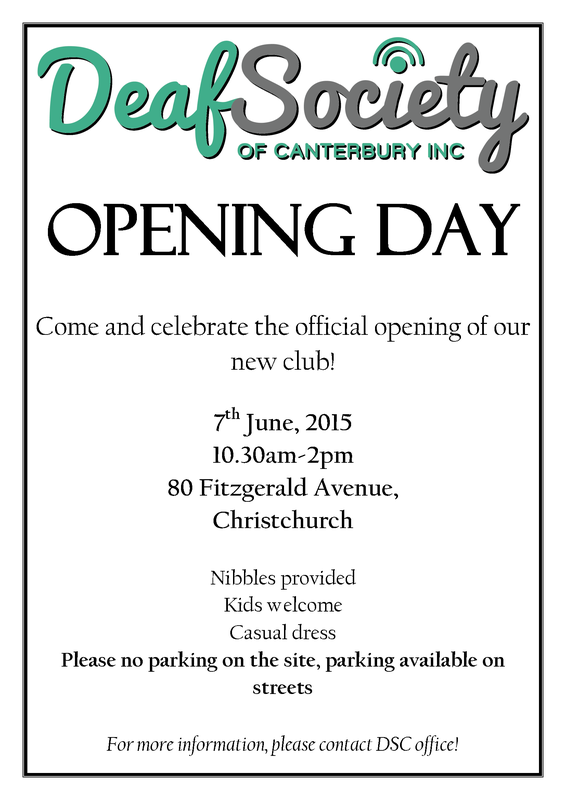 Deaf Society of Canterbury - New Clubroom Opening Day! Come and celebrate the official opening of our new club! You are welcome to join our Deaf Craft Group to learn new skills, projects or finish off your project and please bring your craft. Do you want to give your child/ren an experience in DIY? These two workshops are for 20 young happy builders. It is an easy project suited for both girls and boys between the ages of 5 to 12 years old and please bring old clothes and one parent/caregiver to help with the project. Michelle is away from the office all week, Monday 8th through Friday 12th June. Anna is available Tuesday, Wednesday and Thursday. At this month’s meeting Mojo Mathers, Green MP, will be talking about disability and inequality in general. Come along to a new exhibit at the Toitu Otago Settlers Museum that features a range of pictures of cats and dogs throughout history. The Harlem Globetrotters are returning to New Zealand after their massively successful 2013 tour. The Harlem Globetrotters bring their world famous tradition of ball-handling wizardry, basketball artistry, and one-of-a-kind sports entertainment - this is basketball like you've never seen it before! They combine athleticism, theatre and comedy in a show that is suitable for the whole family – whether you're 7 or 70 you can be sure of a fantastic night out. Many shows sold out last time so don't delay and get your tickets to see the world-famous Harlem Globetrotters - this is a show not to be missed! ​Where: ILT Stadium Southland, Isabella Street, Invercargill. Las Vegas dazzle descends on Invercargill for the biggest corporate event in Southland this year. Kiwi heavyweight sensation Joseph Parker main events the biggest boxing card ever seen in the South Island as he continues his rise up the heavyweight rankings. The current world number 10 has to make good on his promise of being in the top five by the end of 2015 meaning he is certain to encounter a world class opponent in Invercargill. Also on the card lightning fast welterweight thrill merchant Jeff Horn, who is ranking inside the world's top 15 and is widely considered the best boxer Australia has produced in over a generation. Plus Duco's corporate world champion, the 135 kilo Brown Buttabean, will also feature on the card - if he can find someone tough enough in Southland to take him on! Make sure you're ringside for what is guaranteed to be the biggest Joseph Parker fight night to date. 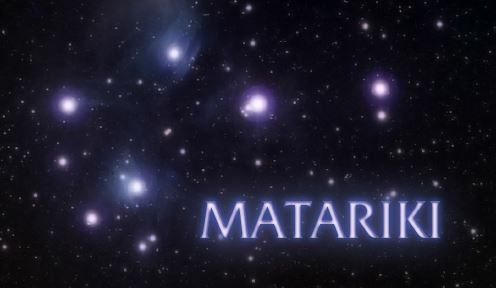 Matariki 2015 will be a joint venture between Venture Southland, Wairoa Maori Film Festival, The Southland Museum and Art Gallery and the Invercargill City Libraries and Archives. 80 minutes of the best in Maori short films will be shown in the SMAG Theatrette, along with forums and kapa haka performances. On Sunday, June 2st1, at 6pm there will be a very special forum based around the work of Stephen Mulqueen, whose exhibition WHAKAMAORITANGA/Translations is currently showing at the museum and art gallery. This is a 360-degree landscape map, which encircles the gallery walls, transporting the viewer to the top of Motupōhue/Bluff Hill. Mulqueen is the current Southland Art Foundation, William Hodges Fellow. Short play readings will accompany the event, using Brian Friel's play, Translations. Constellation Evening: Southland Astronomical Society members will be giving a fascinating insight on the Matariki constellation and Dean Whaanga will share his cultural knowledge about the constellation’s relevance in the traditional Maori calendar. 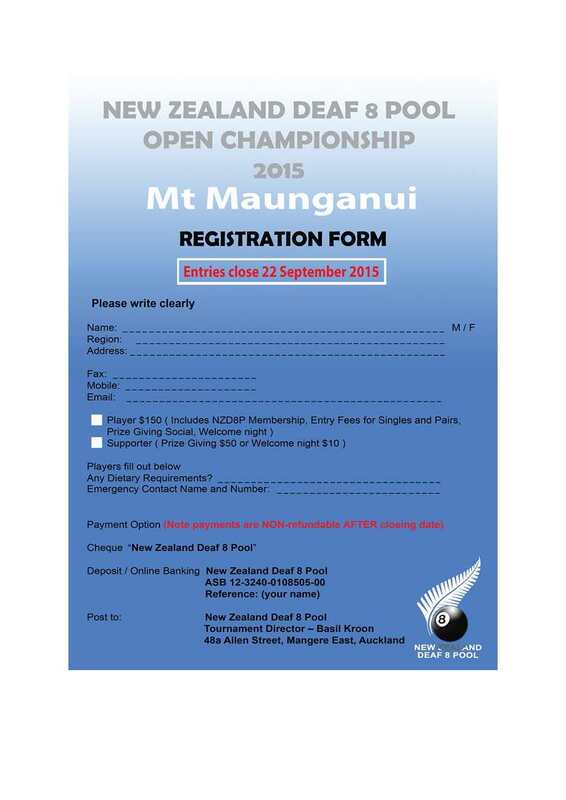 The Verdon Kapa Haka Roopu will be performing at this event. 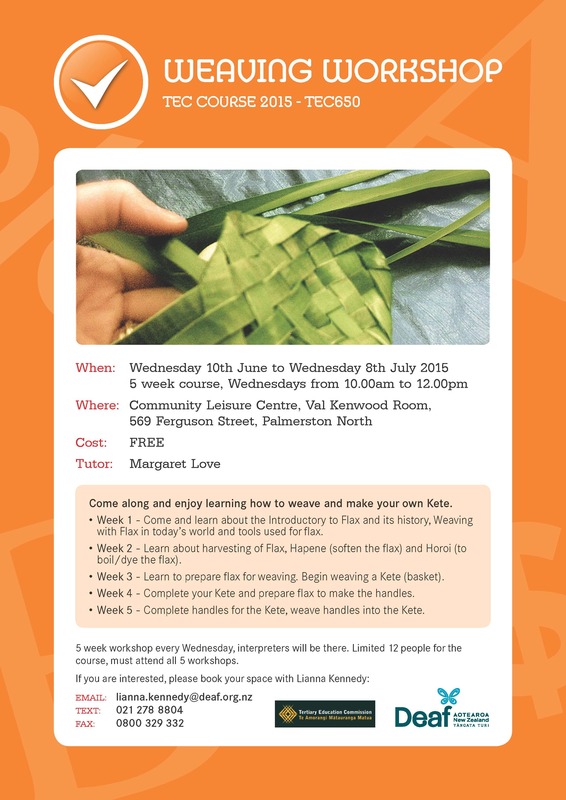 The Southland Museum will host workshops in Harakeke (weaving).